Have you ever wished that you could easily fit all of your shampoos, conditioners and soaps within arm’s reach during your showers? With recessed bathroom shelves, bending over is a thing of the past! You can store anything you need within arm’s reach, including towels and clothes! Now you may be thinking, is this really a good time to install recessed bathroom shelves? Is it a messy affair, and can my bathroom handle it? These are good questions, just like the question of when to increase your shower pressure pump. Now, can your bathroom handle it? Well, if you have drywall in your bathrooms, then chances are your bathroom can handle recessed bathroom shelves. Drywall covers the majority of bathroom interiors these days (the other type of wall material that some bathrooms have is plaster). Behind the drywall you can take advantage of hollow spaces to install recessed bathroom shelves. So when is it a good time to consider installing recessed bathroom shelves? Well, anytime is good really, but the best time is when you’ve already, or are considering, demolishing a part of the house connected to the bathroom; this can free up more space for bathroom shelves. How hard and messy is it to install recessed bathroom shelves? Well, the process is similar to hanging either a picture, shelf or TV mount on the wall. It involves locating your wall studs and working around them, or moving them. Now, when installing recessed bathroom shelves, it might be difficult to find space for the shelves due to pipes, etc. Installing them correctly might involve some venting, electrical and plumbing work. Therefore, if you haven’t opened up a wall before, do yourself a big favor and call a professional. A good thing to recess to make the vanity area feel larger is the medicine cabinet. If you don’t want cabinet doors or drawers getting in the way, then simply put baskets in the shelves to keep your things organized, out of sight and out of mind. Baskets can also make your bathroom look prettier. There are many materials you can use for shelves, including: wood, glass, acrylic, stainless steel, quartzite, and slate. If the recessed area is covered in tiles, make sure there is waterproofing behind the tiles! 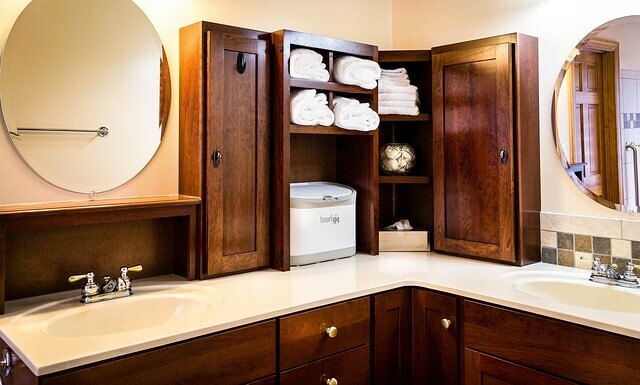 For every bathroom, storage space is extremely valuable. Everybody needs shampoo, conditioner and bath towels, and we’d all like those items to be within easy reach. Therefore, installing recessed bathroom shelves can add more architectural value to your home. When installing these shelves the correct way, you’ve got nothing to lose and everything to gain!